Today we’d like to introduce you to Lisa Pedersen. From a young age, Lisa would escape the noise and business of her childhood home by immersing herself in her art, a custom she has continued to practice her entire life. As an adult, with a background in psychology and different creative arts therapies, she has witnessed firsthand, the benefits of incorporating art into all that she does both professionally and personally. “Painting is a way to capture and express feelings and thoughts when there just aren’t words for what needs to be voiced,” Lisa says. 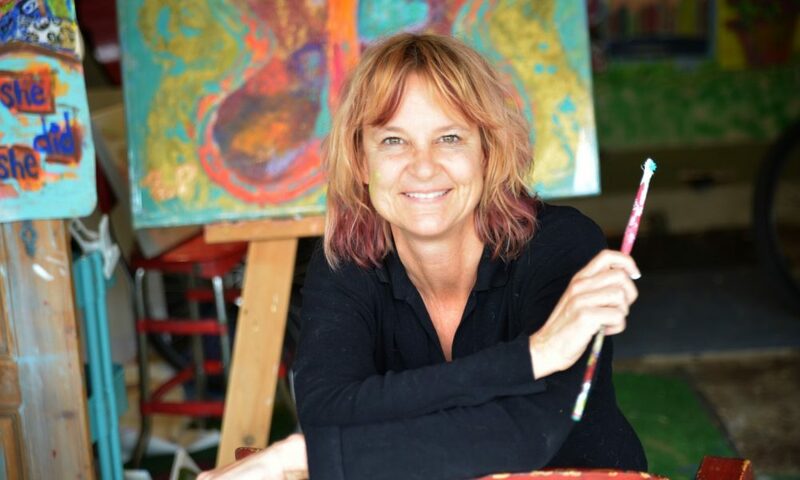 Lisa has begun teaching Find Your heART™ workshops as a way to share her love for intuitive painting, with an intention that creativity will be unleashed for any participant. She also believes in the power of art to bring us all together and launched a social art experiment, called, “6 Degree Art”. Lisa, please share some details regarding this project. Great. So, let’s dig a little deeper into your story – what have been some of the obstacles you faced throughout your journey. The biggest obstacle has been to trust that when one door closes, another opens. When you put yourself out there in the world, especially when it’s a change in career or life pursuit, there’s an expectation that you may be rejected. Isn’t there a saying that for every 10 “no’s” there’s a “yes” around the corner? Maybe it’s for every 20 “no”. The idea is that we would miss that YES, if we did not experience the NO. When I submit to artist calls for entry to curated art shows, I never know if my painting will be selected. I do it anyway. Recently, the “YES” was being accepted into the Los Angeles Art Association as an emerging artist. I submitted 5 images as well as my artist statement. When I was “early accepted” into the program, I couldn’t believe it! Had I not been accepted, I would still submit somewhere else. I simply trust that there’s a better place for where my art should go. I don’t know what the bigger picture holds for me. We all don’t know. Our job is to simply show up and create. We’d love to hear more about what you do – what are you most proud of? I think what I am most proud of is how I am open to helping others, especially those that changed careers. I always (secretly) dreamed of being an artist. Now, I can help others, too. When I started the “6 Degree Art” project, I usually hear people say, “I can’t participate because I’m not an artist”. We all are. We must cultivate it, just like flossing one’s teeth. We need to practice daily. With 6 Degree Art, people can walk away knowing that they were part of something bigger, through the art collaboration. I was always of the creative type growing up. I would play with the neighbors concocting big fantasy worlds, with art and music as our guides. We’d have musical parades. We’d create art and walk around the neighborhood with our goods in tow; these were, I guess, my first art sales. My elementary school art teacher was someone I clung to. I’d go to school early just to paint and be by her side while she was creating her lesson plans for the day. Thanks for sharing information on this emerging artist. It was very interesting and I loved her art. Thanks to Voyage LA for capturing the heart of so many inspiring people. Thanks to friends/family that support me to keep creating. For those I have yet to meet, thank you for enjoying my work.